On this self-guided cycling holiday you follow the flat, car-free and gentle cycle path around Lake Constance. The trip starts in the charming university town of Konstanz and along the way you will see thermal spas, idyllic villages and vineyards. Lake swims - Plenty of opportunities to swim in the lake. 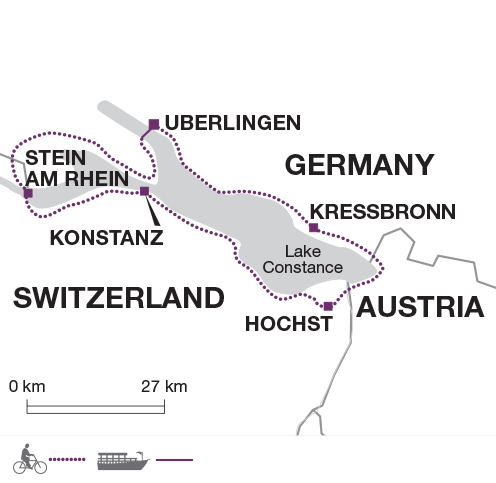 Today's ride takes a route around the German northern shores of the Untersee (Lower Lake) that connects to the Rhine. The town of Radolfzell grew around a monastery founded in 826 AD as a 'cell' under Bishop Radolf of Verona. The town belonged to the Abbey of Reichenau, then subsequently to the house of Habsburg becoming a Free Imperial City for 40 years. Worth visiting is the 15th century gothic Cathedral of our Dear Lady, decorated in baroque style in the 18th. Continue along the Höri peninsula, where Hermann Hesse once lived you cross the 'green border' into the Swiss town of Stein am Rhein, which has a very picturesque old town. This morning you continue cycling around the Untersee, as you ride back towards Konstanz on the southern shores through picturesque Swiss fishing villages. Once back in Germany you ride north through Konstanz to Wallhausen where a short boat crossing with your bike takes you to Uberlingen. The route then continues to the former imperial town of Uberlingen with its gothic minster and beautiful esplanade. Continuing along the lakeside, take your time to explore Meersburg an unspoiled baroque town with the oldest inhabited castle in Germany. The terrace of the New Castle as well as the fortress offer the most unimpeded outlook over the lake and the impressive alpine range on clear days. Continue through vineyards to Friedrichshafen and stop for a rest at one of the cafes on the bustling promenade, one of the longest and most beautiful on Lake Constance. You end the ride meandering through orchards to Kressbronn. According to hotel availability at time of booking you may need to cycle one kilometres further to spend the night in nearby Nonnenhorn. Today's first highlight is the charming Castle Montfort in Langenargen, built in a Moorish style. Adjacent to the castle is Germany's first suspension bridge, the Argenbrücke. Next, you will be cycling through orchards until you reach the Bavarian town of Lindau - a must-do is to visit the city centre on the island, full of medieval and half-timbered buildings. From here is a short ride to the Austrian border and the festival town of Bregenz, where you should visit the floating stage, go for a swim in the lake and visit the well preserved upper town. Once you arrive in Hard, you cross the Rhine, which flows in from the Swiss Alps. The estuary is an important nature reserve. Your final destination for the day is Höchst in Austria. According to hotel availability at time of booking you may spend the night in Rorschach just across the border, in Switzerland. The last ride is devoted to the Canton of Thurgau which is endearingly known as 'Mostindien' (Cider India) because of its huge apple orchards and slightly remote location, at least from the Swiss perspective. The route takes you along the banks of the lake to the old St. Gallen harbour town of Rorschach with its stately public buildings and unmissable Kornhaus (granary) built in 1749. Bathing in the lake here is also very popular. Continue riding through several small villages back to Konstanz. Day 1 or Day 7 - Depending on flight times it is worth taking time to visit the cathedral of Muenster Unserer. Day 2 - Visit the old museum of Kloster Sankt Georgen set in an old Benedictine Abbey. Day 4 - After exploring Meersburg castle, if time perhaps stop off at the adjacent Zeppelin museum which has a large collection of exhibits. This trip also provides fantastic photo opportunities throughout with the stunning lake and mountain views and the historic architecture. Bring cycling gear such as quick drying cycle tops, padded cycle shorts and cycle gloves. The weather can be changeable so we recommend to bring layers of clothing to give you flexibility to add or remove a layer depending on the weather. Also bring a jacket/fleece and warmer clothing for the start and end of the season. A waterproof cycle jacket is recommended in case of rain. A light windproof jacket is always useful. Bring one main piece of baggage as per your airline luggage allowance, maximum 20 kg per person. Remember you are expected to carry your own luggage if using public transport so don't overload yourself. Luggage transfers between hotels are normally arranged by the hoteliers. Mark your bags clearly and leave them at the place and time arranged with them. When travelling on public transport you should always take your luggage with you. On all Explore cycle holidays we strongly recommend you bring along and wear your cycle helmet. In case of an accident resulting in personal injury, certain insurance policies are invalidated in cases where a helmet was not being worn. Cycle glasses to protect against dust, pollen and the sun, padded cycle gloves and a water bottle or water delivery system (e.g. camelback or platypus) are also useful. You may choose to bring your own gel seat cover for added comfort. Other items to consider bringing are a sunhat and sun cream, torch, earplugs and insect repellent. If a handle bar bag or pannier is not provided (check bike details below) then you may like to bring a small rucksack to wear while cycling. A lock, pump, spare inner tube and puncture repair kit with tyre levers is provided with the bike. Please carry some or all of your cycling equipment e.g. helmet as part of your hand luggage. Zurich in Switzerland or Friedrichshafen in Germany. We recommend return flights to either Zurich airport in Switzerland or Friedrichshafen airport in Germany. Zurich has direct flights from London, Manchester and Leeds. In direct flights are possible from other regional UK airports. Friedrichshafen has indirect flights from London and several regional airports. The closest airports to Constance are Zurich in Switzerland and Friedrichshafen in Germany. There is an hourly train service connecting Zurich airport with Constance train station (journey takes 1 hour 10 mins, around 15 Euros). On arrival take a taxi to your hotel. Travel by train from the airport to Friedrichshafen Hafen train station and port (12 mins). From here on foot follow the signs to the catamaran office and catch the ferry directly to Constance port (catamaran runs every hour from 6 am to 7 pm and trip takes 1 hour 15 mins) . From here take a taxi to your hotel. Switzerland: Visas are not required by UK, E.U Nationals, Australian, New Zealand, US and Canadian citizens. Other nationalities should consult their local embassy or consular office. Austria: Visas are not required by UK, Australian, New Zealand, US and Canadian citizens. Other nationalities should consult the relevant consulate. Germany: Visas are not required by UK, Australian, New Zealand, US and Canadian citizens. Other nationalities should consult the relevant consulate. On this journey you cycle 209 km over five days (an average of 42 km per day) with further optional rides available. The rides mostly follow cycle paths or quiet secondary roads that run close to the lake. Occasional sections are unpaved and around Friedrichshafen the cycle path is alongside the main road. The terrain is generally flat with some inclines on the first two days of cycling. We have graded the route as easy. Your included bike is a 24 gear hybrid bike and will be the correct frame size for your height. The bike is fitted with a saddle bag, handlebar bag and a rear pannier. The bike has the facility to fit your own pedals or saddle if you wish to bring them. A lock, pump, spare inner tube and puncture repair kit with tyre levers is included. All you need to bring is your own helmet. You will be required to sign an agreement of care upon receipt of the bike. Mon 1 Apr 2019 - Sun 28 Apr 2019 Your trip can depart anytime between the above dates. Contact us for triple room requests and solo traveller prices. Mon 29 Apr 2019 - Sun 19 May 2019 Your trip can depart anytime between the above dates. Contact us for triple room requests and solo traveller prices. Mon 20 May 2019 - Mon 17 Jun 2019 Your trip can depart anytime between the above dates. Contact us for triple room requests and solo traveller prices. Tue 18 Jun 2019 - Sun 30 Jun 2019 Your trip can depart anytime between the above dates. Contact us for triple room requests and solo traveller prices. Mon 1 Jul 2019 - Mon 26 Aug 2019 Your trip can depart anytime between the above dates. Contact us for triple room requests and solo traveller prices. Tue 27 Aug 2019 - Mon 30 Sep 2019 Your trip can depart anytime between the above dates. Contact us for triple room requests and solo traveller prices. Tue 1 Oct 2019 - Thu 24 Oct 2019 Your trip can depart anytime between the above dates. Contact us for triple room requests and solo traveller prices. Wed 1 Apr 2020 - Tue 28 Apr 2020 Your trip can depart anytime between the above dates. Contact us for triple room requests and solo traveller prices. Wed 29 Apr 2020 - Tue 19 May 2020 Your trip can depart anytime between the above dates. Contact us for triple room requests and solo traveller prices. Wed 20 May 2020 - Wed 17 Jun 2020 Your trip can depart anytime between the above dates. Contact us for triple room requests and solo traveller prices. Thu 18 Jun 2020 - Tue 30 Jun 2020 Your trip can depart anytime between the above dates. Contact us for triple room requests and solo traveller prices. Wed 1 Jul 2020 - Wed 26 Aug 2020 Your trip can depart anytime between the above dates. Contact us for triple room requests and solo traveller prices. Thu 27 Aug 2020 - Wed 30 Sep 2020 Your trip can depart anytime between the above dates. Contact us for triple room requests and solo traveller prices. Thu 1 Oct 2020 - Sat 24 Oct 2020 Your trip can depart anytime between the above dates. Contact us for triple room requests and solo traveller prices.